Ships today if you order in the next 8 hours 7 minutes. 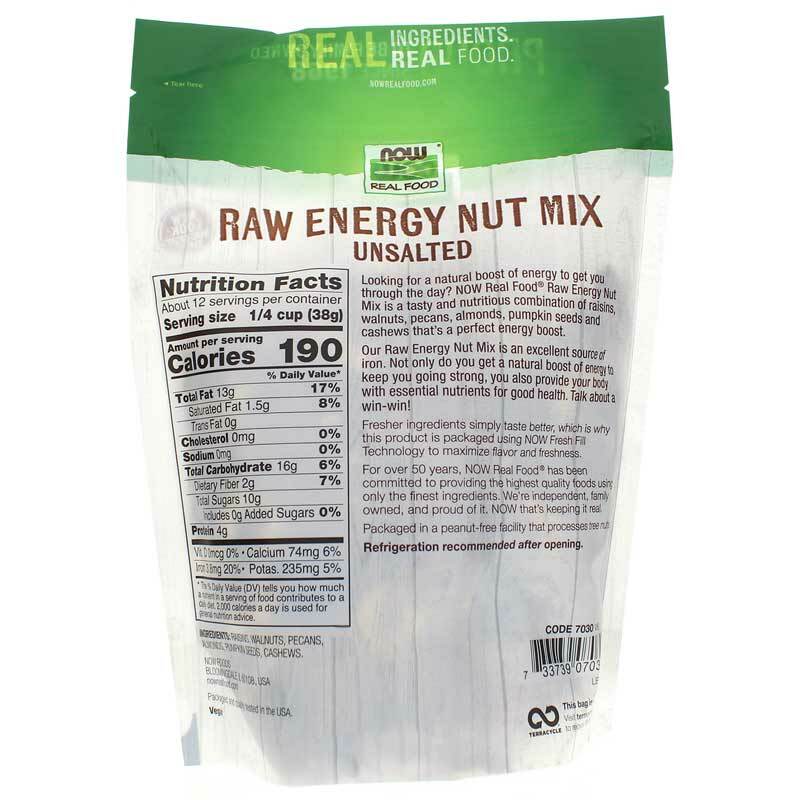 Now Real Food Unsalted Raw Energy Nut Mix provides a healthy energy boost with a mix of tasty and nutritious mixed nuts and raisins. This unsalted fresh and tasty treat combines raisins, walnuts, pecans, almonds, pumpkin seeds, and cashews. And, uncommon in snack foods, mixed nuts are low in sodium, too much of which can promote water retention and high blood pressure. 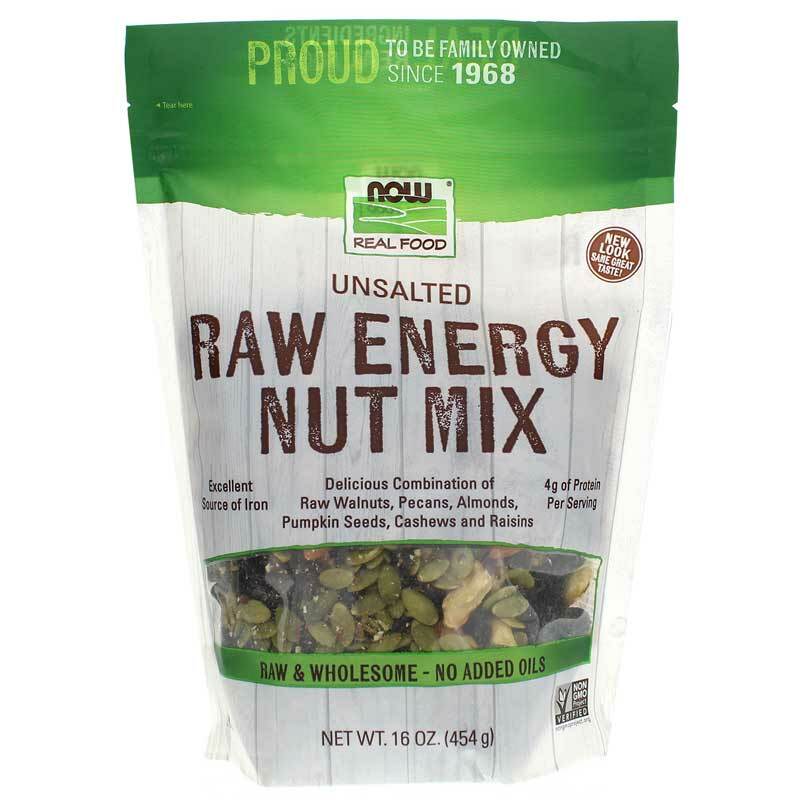 Now Real Food Raw Energy Nut Mix has been packaged using Now Fresh Fill Technology, a natural blend of carbon dioxide and nitrogen that displaces oxygen in the bag to maximize flavor and freshness. To retain freshness, refrigerate after opening. Ingredients:: Raisins, Walnuts, Pecans, Almonds, Pumpkin Seeds and Cashews. Refrigeration Recommended after opening. Fresher ingredients simply taste better, which is why this product is packaged using NOW Fresh Fill Technology, a natural blend of carbon dioxide and nitrogen that displaces oxygen in the bag to maximize flavor and freshness.